What is the font used in Stackexchange Math? What is the font family and the sizes used in Stackexchange Math content and headings? I think it is a readable font. It would be nice if we use it also in web pages involving mathjax. If it is not free, is there a similar font family which is free to use on webpages? And then a mix of Arial, Helvetica, Helvetica Neu, and other sans serif fonts are used for reputation numbers, tables, counts, etc. MathJax uses the STIX font family if installed on the user's computer. It's very close to Georgia and Times New Roman, the traditional kind of typeface used in scholarly publications. The STIX font family is given out for free (OTF format) by a group of science&technology publishing companies, see http://www.stixfonts.org and MathJax's user help pages: http://www.mathjax.org/help/fonts/ Also, the STIX font family happens to be preinstalled in OS X 10.7. If the STIX font is not installed, MathJax resorts to other suitable fonts depending on operating system and browser version, including web fonts. The MathJax documentation has more on these internals: http://docs.mathjax.org/en/latest/options/HTML-CSS.html What MathJax font configuration is used on Mathematics SE, you probably better ask in their Meta forum. 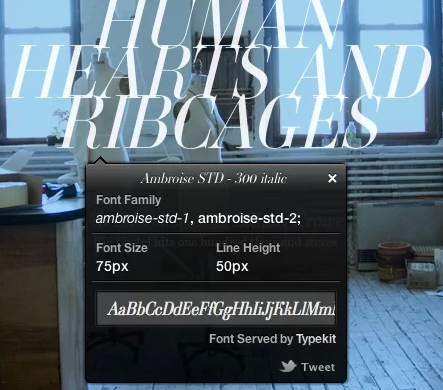 Using the magnifying glass icon, click on whatever text you want to see the font-family for. Chrome What Font Extension can be a little faster if you aren't used to DevTools. Not the answer you're looking for? Browse other questions tagged fonts font-identification font-size or ask your own question. What font type was used in “Kevin O'Malley” found at the bottom of the cover of the How They Croaked book? What font is used widely for mobile app ui mockups? What font is used on this Danube Dragons T-shirt? What font is used on the “Passengers” movie poster? What font is used on Junghans' Max Bill watch face?